our schools become increasingly rich and positive places to learn and grow." 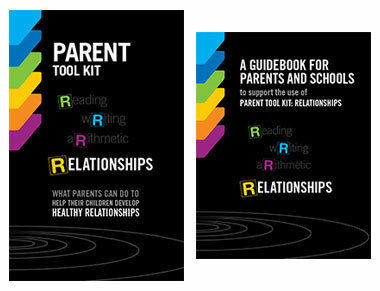 Parent Tool Kit: Relationships: This booklet is a guide to help their children develop healthy relationships. It contains six different sections focussing on topics such as mental well-being, conflict resolution, bullying prevention, social media and resilience. The tips and suggestions have been provided by parents across the province who wanted to share their ideas. Educators, students and people with research expertise also helped to provide content. A Guidebook for Parents and Schools: The guidebook provides sample activities for parent groups to learn more about the ideas included in the Tool Kit.